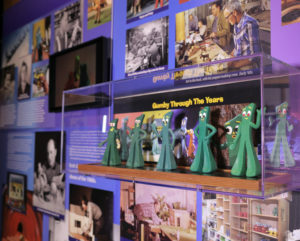 The new “Get Animated!” exhibit, created by Stage Nine Entertainment, includes a number of elements focused on the iconic Gumby and his creator Art Clokey. 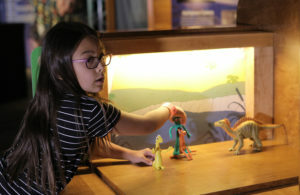 The exhibit, which opened at the Arizona Science Center in summer 2017, moved on to the Bishop Muse um in Honolulu from September 2017 through January 2018. “Get Animated!” is a journey through the history of animation, and it allows visitors to experience every step in the animation process. It brings to life the evolution of animation from traditional hand-drawn cels to exciting breakthroughs in stop motion and CGI. Gumby is highlighted along with other famous characters from well know animated cartoons and films, including the Simpsons, Bugs Bunny, Scooby Doo, Porky Pig, Tom and Jerry, Tweety Bird and many others. This traveling show is an exciting interactive, hands-on exhibit. 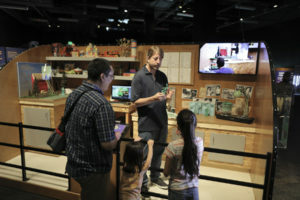 The Clokeys worked closely with Troy Carlson and his team at Stage Nine Entertainment to create and develop the Gumby portion of the exhibit. A brand new Gumby stop-motion short, animated by Anthony Scott, Premavision/Clokey Productions’ Animation Director, introduces the exhibit. Get a sneak peek here. Anthony got his start in stop motion with Gumby on the 1980’s series and went on to work on Nightmare Before Christmas, Coraline, James and the Giant Peach and a long list of other highly acclaimed feature films. A reconstruction of Gumby’s stop-motion studio with animation area, puppet making area, prop area complete with vintage toys like those in the episodes of the ‘50s, ‘60s, and ‘80s. Videos showing various aspects of Gumby and the stop-motion process. They include snippets such as, “Meet the Animator,” “Making a Clay Puppet, and an interview with Art Clokey. Real clay Gumby puppets, including “Gumby through the Years,” showing how he’s changed with each new TV series. Vignettes of your favorite characters: Pokey, the Blockheads, Prickle, Goo, Professor Kapp and Minga are also on display. The set of 1963 episode “Hidden Valley” has been reconstructed. Another display (the Web of Influence) shows how Art Clokey taught, mentored and inspired many of today’s world-famous animators, artists, and crew. A giant Gumby sculpture is on hand for photo ops. Kids can create their own stop-motion video using Gumby, Pokey and pals bendable toys. Kids and adults alike have been enjoying this exhibit tremendously and finding it fun and informative. Our teacher fans who love Gumby (and the animation) are encouraged to use this exhibit as a learning tool. Field trips to the exhibit are encouraged and there is a Teachers’ Guide available to use before, during and after the visit. The Guide explains that “Get Animated!” takes students on a journey through the history of animation, from pre-film animation devices to the computer-generated animated films of today. Discover the men and women who have contributed to animation through the ages and learn what films, tools, or characters they introduced to the world. Take a behind-the-scenes look at the making of your favorite animated shows and movies, and view old drawings, sets, and notes used in these productions. You can even try your own hand at animating! The exhibit will travel throughout the county and be in each location for about 3-6 months. The exhibit name may change at each museum, so we will keep you informed of where you can experience the Gumby fun firsthand.